The Caraka Samhita stands at the top of the ancient texts representing the School of Medicine in Ayurveda founded by the great Scholar-Sage Punarvasu Atreya. 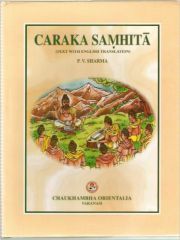 Its value is further enhanced by the fact that it is the only text available in complete form where as other contemporary Samhitas such as of Jatukarna, parasara etc. perished, that of Bhela is incomplete and that of Harita is dragged into controversy. Thus any scholar desirous to know about the fundamentals of Ayurveda and its approach to life, health and disease has essentially to take resort to the study of this text unique in depth and divergence. It is rightly said "whatever is not here can t be found anywere else." Historically too, it is quite interesting. Like an archaeological edifice. If it is dug into one would come across three distinct strate of authorship ascribed to Agnivesa, Caraka and Drdhabala in successive order. This immensely valuable text needed since long a faithful and simple translation into English communicating the ideas as they are without divulging into dogmatic details which make the situation worse particularly for a young scholar. This comes from the pen of an erudite scholar of Ayurveda who has devoted the major part of his life in studying the text intensively from various angles and has command over both the languages concerned.